Mozilla Thunderbird is one of the popular, safe and fast email clients which is pretty easy to use as well. Just like Firefox, Thunderbird also support a vast number of Add-ons. 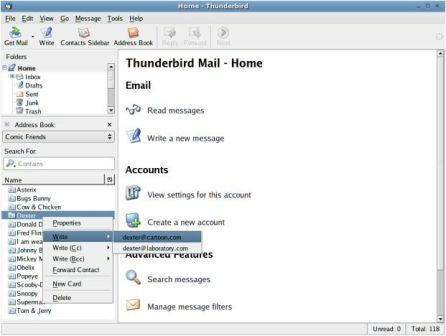 Listed here are the Top 5 useful add-ons for Mozilla Thunderbird. 1. Contact Sidebar: Contact Sidebar displays all available address books in a sidebar in the 3-pane-window of Thunderbird. It makes all your contacts easy accessible from the main window to quickly write messages, or to edit the properties of a contact card. It also allows you to drag & drop files and messages to a contact to easily add attachments to a new message to this contact. 2. 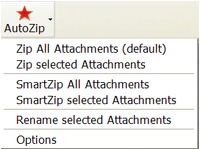 Auto Zip Attachments: Auto Zip Attachments allows you to easily compress (zip) attachments. A button named “AutoZip” is added to the compose toolbar. Upon pressing the button all the attachments would be compressed into a single file. Then the attachments are replaced with the zipped file. This add-on gives lot of options for compressing and naming a file. 3. Attachment Extractor: Attachment Extractor has the ability to extract all the attachments at the same time without having to select each attachment and then extracting it. With this add-on, all you need is to select the messages having attachment and select “Extract attachments”. This is again a very useful add-on for people having lot of attachment mails. 4. Signature Switch: Signature Switch allows you to create multiple e-mail signatures for personal, business etc and easily switch between them while sending mails. 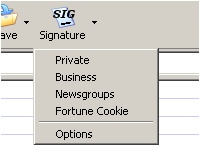 It also provides configurable signature auto-switch option based on the email recipients. 5. Send Later: Send Later allows you to compose a mail and send it at a later scheduled time. When the “Send Later” option is chosen (Ctrl+Shift+Enter- shortcut), the extension saves the message to draft and monitors the messages in the draft folder, when the chosen time arrives it moves the message to unsent and sends unsent messages. There are few other add-ons which are useful ones like the Mail Redirect (which allows to export emails to email id), Quick Folder (organizing folders), GmailUI (Gmail concepts in Thunderbird). If you have any other useful add-on for Thunderbird, please share it here. If you have not used Thunderbird yet, you can download it from here. Checking out #2 and #3. They seem to be useful when working at tandem. I m a lover of thunderbird but i never used any plugins but from now i will start using all of them. I hope they wont slow down thunderbird ? I dont think it will slow down Thunderbird, its similar to Firefox add-ons. I have heard a lot of GmailUI and AutoZip on other blog reviews also, they seem to be the best! I haven’t tried out Thunderbird till now, but I just may seeing how good it sounds. Mail scheduler seems to be a good plugin. But what will happen if your computer will be off at that point of time???? Thunderbird is worth a try although its not the best Email clients. I’ve never used ThunderBird , but after reading this article I’m going to try it out . Did you check it now??? I’m not able to check it as the Firewall client in my office is not allowing me to access Gmail from Thunderbird. Let me try it again and will let you know If I’m able to connect. I use Thunderbird everyday, but never touch the extension section! 😀 Thanks for the tips. I will definitely try it out! Stumbled! May be I should switch to Thunderbird soon. Nice list for my reference later! thunderbird is one of the best mail client. try it!